I have done aerial views of some of my listings over the years. A friend has a small plane that he keeps at the Pickens County airport so I’ve hit him up for a ride to shoot some aerial photography. That involves banking the plane over the property while I take pictures. We enjoy each other’s company so it makes for a fun and productive time. Recently I used Stan Jessen, North Georgia Drones, LLC , to shoot some aerials of the 20 acre Fern Creek Farm I have listed in Dawson County. Being the first time using a drone, this one was a learning experience for me, but very worthwhile. I like the idea of being on terra firma while watching a drone some 400 feet above taking the pictures. It beats leaning on the window of a banking plane. Click here for pictures of the farm. 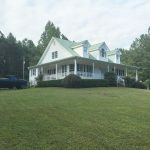 Just listed in Dawson County a 20 acre farm with guest house, in-ground pool and riding arena all in a private setting. Click here for details. Here we are a couple weeks from the national election. It is an axiom in the real estate industry that home sales slow before elections. At least that’s the excuse we realtors use as to why your place is not selling. Word on the street (i.e., I heard this from other realtors) is that the Atlanta suburbs have recently experienced a significant slowdown in activity. Well that’s not the case in my market area. We closed on the 10 acres in Bartow County a couple weeks ago and we are scheduled to close on the 50 acre farm in Gordon County next week, the 55 acre parcel in Murray County in November, and a 15 acre farm in Pickens County in early December. That’s the good news for me. The bad news is that we need listings again. If you are considering selling your farm, please give me a call. My wife and horses would appreciate it. 770-289-7272 or email me at rich@richvigue.com. I was a member of the event committee, a sponsor, and a volunteer at this year’s Georgia Equine Rescue League’s Rescue Challenge. Patterned after the Mustang Challenges, this involves trainers working with rescued horses and then showing what they accomplished by competing in this one day event held at the UGA Livestock Arena in Athens. The national award winning Diamond D Cowgirl Drill Team opened the event. I happened to be standing at one of the arena gates when they did their routine and caught some of it with my cell phone to show my granddaughter who’s becoming quite a horse fan. It’s not much of a video, but here it is below. Just listed a 55 acre parcel located in Murray County. It was part of a family farm owned by the same family for a hundred years. It’s located on Barney Pierce Road only a few miles from the center of Chatsworth. For sale at $3,000/acre this is a good buy. Click here for details. Just completed this short video of Hillside Farm in Talking Rock. The video focuses on the farm setting giving the viewer a good perspective of the farm layout. Click here for details about the farm. Located in Hall County just outside of Gainesville is this incredible 53 acre farm. Currently owned by a gentleman farmer who uses the property as a family getaway and keeps it in prime condition. I’ve been on this property several times and I can tell you it is a big 53 acres and would be excellent as a large horse operation, for other livestock, or as a family compound. Possible additional acreage available Click here for details and pictures. A friend of mine has an upscale horse property for sale that is located in southeast Cherokee County just outside of Fulton County. It is a real nice property in a quiet equestrian neighborhood and is within commuting distance to Atlanta. If you’re looking for a top-of-the-line equestrian property and want to be able to enjoy all the benefits of the Atlanta suburbs you should check it out. Click below to see details on the property. A good friend has a 10 acre parcel for sale near Mount Rogers, Virginia in the heart of wonderful trail riding country. I’ve spent a week riding in the area and I can tell that this is trail riding heaven. Her place is located in a large valley that reminds me of southwest Montana. If you’re looking for a weekend or occasional trail riding getaway check this place out. Click here for details.